One of the great conveniences of modern-day travel is the ability to print your own airline boarding passes in the comfort of your own home/office/hotel room/motorcycle sidecar/wherever. 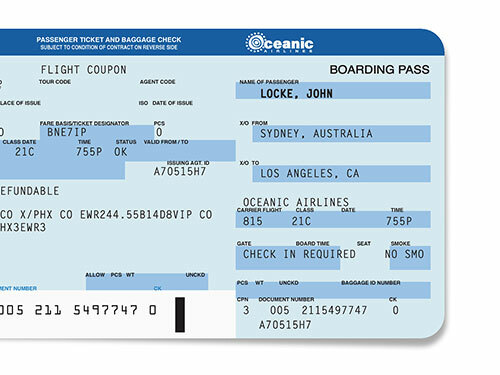 Oceanic Airlines has gone a step further by allowing you to not only print your own boarding pass, but to choose your own flight number, seat, date and time of departure, origin and desination city, passenger name, and endorsements and restrictions! Now that’s customer service. 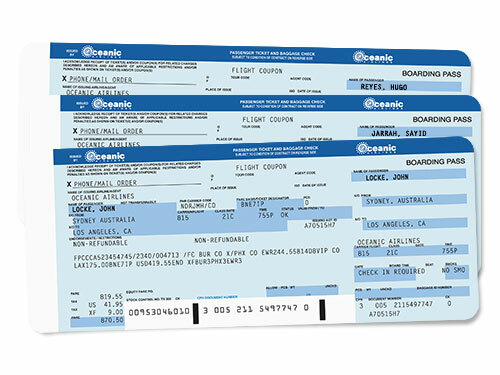 How do you go about printing your own Oceanic boarding passes? It’s as easy as 1, 2, 3, 4, and 5. 1. Download the fillable PDF below. 2. Use Adobe Acrobat to enter in the pertinent information for the boarding pass recipient: flight, seat, date, time, origin, destination, name, endorsements/restrictions. 3. Print out—it looks better in color—the pass onto to some nice, heavy, white cardstock. 4. Use a straight-edge to trim out your boarding pass, and don’t forget to round the corners. 5. There is no 5—you’re done! See how easy that was? Now, don’t forget that while you can put any kind of information you want on your Oceanic Airlines Boarding Pass, the TSA won’t let you through a security checkpoint without documents for a actual flight. So, if you aren’t printing passes for Oceanic Airlines travel, you can use them for party invitations or something. This entry was posted on Tuesday, May 18th, 2010 at 3:06 pm	and is filed under Film/Video, Graphic Design. You can follow any responses to this entry through the RSS 2.0 feed. Responses are currently closed, but you can trackback from your own site.